I was born in Chicago in 1969, but grew up in the suburbs—Bloomingdale, Illinois, to be specific. I went to college in Iowa, spent some time in Minnesota, and eventually found my way back to the City in my late twenties. I now live in Uptown, a stone's throw from the Aragon Ballroom, and just around the corner from "Little Saigon" and the excellent Vietnamese, Thai, and Chinese restaurants that line a short stretch of Argyle Street. While I'm relatively new to the Uptown neighborhood, both of my parents grew up around here. My dad lived in Andersonville, and my mom grew up near Lawrence and Hermitage. 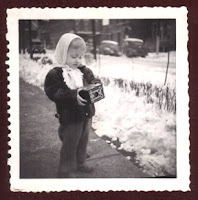 (That's her in 1948 or so with a new Brownie camera.) Technically, I'm the fourth generation on both sides of the family to call this neighborhood home. Of course, that was Uptown in its so-called heyday. Since then, it's gone through many cycles of decay and rebirth, and has been home to numerous new immigrant groups. Uptown is always reinventing itself. Today, it's one of the most diverse neighborhoods in Chicago, and one that is--for better or worse--undergoing rapid gentrification. The purpose of this blog will be to share some of the many hundreds of images and stories I've collected about Uptown these last five or so years. If you have stories to share, or if anything I post triggers a memory of your own, please feel free to make a comment or send me an e-mail.